Although acupuncture can sometimes be helpful for ringing in the ear (tinnitus), hearing loss is much more difficult to treat. As is usual, preventative medicine is best. Exposure to levels of sound as low as 85 dB can result in hearing loss, so loud music played though headphones and common household items such as vacuums and coffee grinders are potentially dangerous. Lawnmowers, garden equipment, and many power tools also generate enough noise to damage hearing. A screaming child can also easily create levels that will cause damage, as can many theater sound systems. Also of concern is the potential for loud noise to create stress levels that can damage the heart, an observation consistent with Chinese medical theory. We recommend that hearing protection be worn whenever exposure to potentially damaging noise levels occur. Inexpensive foam earplugs should be carried in your purse or brief case, and always used whenever power tools are in use. Take them with you whenever you go to a movie theater or concert, and adjust your music devices to play at safe levels. Congress is always ready to make a bad situation worse, and they are experts when it comes to adding a new layer of inefficient bureaucracy to an already failing medical system. One of the more recent is the legislation creating the "Medicare Advantage" plans that were supposed to reduce the out of pocket costs of Medicare patients and reduce payments to insurance companies, saving taxpayers’ money. In fact, according to a Government Accounting Office report dated February 28, 2008, Advantage plans in 2007 were paid 13% more than the cost of care in fee-for-service Medicare, and, in addition, 19% of patients paid more for these services than they would have in regular Medicare. One-half of cardiac surgeons are over 53 and many are contemplating early retirement due to financial factors and decreasing job satisfaction. According to Dr. Andrew S. Wechsler, professor of cardiothoracic surgery at Drexel University in Philadelphia, the pipeline of future surgeons is "essentially nonexistent". Dr. Wechsler points out that the falloff in applicants for training positions began about 4 years ago and positions now exceed applicants. Last year there were 97 applicants for 130 training positions, and only 68 were graduates of American medical schools. Dr. Wechsler told a conference of the Society for Cardiovascular Angiography and Interventions that he feels the quality of the applicants has dropped off also: "anyone who has reasonable qualifications will be accepted by a program somewhere." Reimbursement for cardiac surgery today is, in real dollars, about 30% of what it was 15 years ago, cases have become more complex, and the average yearly cost of malpractice for surgeons in Pennsylvania is $125,000. Training programs have decreased the number of years and the breadth of experience that was once required to try to entice students to enter the field, but without success. The US Department of Health and Human Services inadequately supervised Medicaid demonstration projects in Florida and Vermont, which were supposed to be budget neutral by law, so they actually cost $6.9 billion more in Florida and $246 million more in Vermont. People who drink moderate amounts of alcohol (14-28 standard drinks a week for men, 7-14 standard drinks a week for women) have better verbal skills, memory and speed of thinking than teetotalers or heavier drinkers. (The Australian National University Press Release). Nondrinkers who began drinking moderately experienced a 38% reduction in cardiovascular events over 4 years compared with continued nondrinkers. The statistics result from the "Atherosclerosis Risk in Communities", which is a National Heart, Lung and Blood Institute ongoing prospective study of 15,792 middle-aged black and white men and women free of known cardiovascular disease and diabetes. Calcium not only failed to prevent hip fractures, it actually was associated with an increase in fractures according to a new meta-analysis. A study at University Hospitals in Cleveland indicates that Prozac treatment is no better than placebo for treatment of depression in adolescents who also have substance abuse disorders. Ed. Note: One wonders why Dr. Douglas cannot call this an epidemic. It is likely that numbers are comparable for 12-13 year olds, and data that is more recent is likely to show increases. Perhaps the State of Texas should seize all these girls and put them in foster homes. Another study has confirmed the link between consumption of red meat and colorectal cancer. Nearly half a million Europeans were enrolled in the study between 1992 and 1998, when all were free of cancer, and supplied details of diet and lifestyle. After 4.8 years, 1329 cases of colorectal cancer were recorded. After adjusting for a variety of known risk factors, those who ate the highest amounts of red and processed meats were found to have a 35% greater risk of developing the cancer. By contrast there was a risk reduction of nearly a third (31%) for people who consumed one portion or more of fish every other day compared with those who ate fish less than once a week. (Journal of the National Cancer Institute, Vol. 97, No. 12, 906-916, June 15, 2005). Twenty-four female subjects who perceived themselves as mentally stressed and who took up Iyengar yoga (two 90-minute classes a week for 12 weeks) reported significant improvements in perceived stress, anxiety, well-being, vigor, fatigue and depression. There were also significant reductions in headache and back pain. (12th Annual Symposium on Complementary Health Care, 19-21 September 2005, Exeter, UK). Israel’s health ministry has recommended that consumption of soya products be limited in young children and avoided as far as possible in infants. In addition, it recommends that adults consume soya products only in moderation. They are concerned about emerging evidence, mostly from animal studies, that the high phytoestrogens present in soya may be implicated in male infertility and some kinds of cancer. Soya consumption is high in Israel as kosher food practices prohibit consumption of dairy products within six hours of eating meat. (Jerusalem Post, 7/20/05). Even for those with no history of cardiovascular disease, telling a man he has prostate cancer boosts the overall risk of heart attack and cardiovascular events by 50 per cent in the first year, particularly in the first week after learning of the diagnosis, where the risk of dying increases 800%. Men aged 54 or younger are nine times more likely to die from cardiovascular events within a year of diagnosis, whereas those 55 to 74 have a 200% risk increase. The risk drops to 30% in those over 75. In the next absurd development of that first "robot doctor" debacle that stimulated these editorials, physicians and patients have now moved on to believing in the fallacy of "virtual patient visits". According to an article in the May 1, 2008 Family Practice News, "virtual visits are means to improve quality and access to care and to decrease costs." Certainly, one would expect a decreased cost, because these "visits" are worth nothing. How are costs reduced? Well, the only way is to reduce the time spent on the encounter. Physicians have quickly come around to the idea that time is money, and the more numerous and complex the procedure codes you can generate per time interval, the more likely you are to stay solvent. At the other end of the spectrum, we could have an economic model of lower payments for 1-2 minute "visits" where some doctors and "physician extenders" could code for hundreds of these encounters a day. In an eight hour workday, at a rate of 45 an hour we could have 360 "virtual visits"! Even at a low payment of $15.00, that would be $5,400.00 a day, a very nice cash flow even if the patient has to pay a $5.00-$10.00 "co-pay". Nobody outside of India will be doing this full time, but how will you really know that the person on the other side of the console is a real physician? At least at a real visit, you can tell if your physician is multitasking, bopping on their iPod, sleep deprived, or stinking of Scotch. Without any exam, no supplies, no gowns, no table paper, no soap or water for washing of hands, no heat, no furniture, no waiting room, nor support staff is necessary, obviously saving money. A room of windowless cubicles is an ideal office space for such technicians, and all such savings will flow to the coffers of the already too-fat, fat cat executives and their bloated staff. Instead of focusing on how much something costs in medicine and who will pay for it, perhaps it is more important to consider what is worth paying for. Just because we can make something cheaper doesn’t mean it is better. As perhaps the last physician in America who has 27 years of experience of running a practice where time is not arbitrarily limited, I must point out that in face to face encounters, a lot comes up that is not only relevant to the problems at hand, but is often essential. The spontaneous nature of these aspects of a real encounter contributes information that significantly changes the treatment for that day, and maybe for considerably longer. Physical exam results or observations always elicit some further inquiry into a related organ system or function. Most often, the patient is not aware of all of these relevant factors, so frequently my question will be answered with a "well, now that you mention it, I am having that (problem or symptom)." It is not unusual for this to happen even several times during a visit, as the pattern of imbalance unfolds. This underlines the importance of having all the traditional results of questioning, touching, looking, listening, and smelling available to the doctor. With a monitor, you have seriously limited these factors, and with email, you have eliminated them entirely. It is also common that the original complaint is not even the issue that is most clinically important. If physicians expect patients to provide all the relevant information in an email or a virtual visit, the diagnosis could be dangerously inaccurate. For complex or chronic disorders, or with unsophisticated or frail patients, the risk of missing something increases further. Earlier this month I was speaking to a Jungian analyst about the loss of the connectiveness of touch that has pervaded modern practice. I’m not referring to a hug or a touch on the hand, which passes for "sensitivity" in many practices, but to the informed and probing connection, both physical and mental, that reveals the true nature of a disorder and how it has affected the individual. Whether you are palpating the channels or examining lymph nodes or a suspicious mass, the human touch is the only standard that exists. Our senses cannot be duplicated by even the most sophisticated technology. The efficiency of going right to the source when faced with a medical issue is ultimately the most cost-effective way for doctors to practice. This would be even more obvious if actual clinical improvements were measured in the "quality" evaluations of medical system-lords, instead of an exclusive focus on costs and statistical fallacies as presently. Medicine has always been and will always be a relationship, with the consequent risks and challenges of any relationship. In addition,there is the added complexity of a significant professional component. Both practitioners and patients have to invest something of themselves to make this process of therapy work, and "virtual" reality has no place in this process. The very reason that I was discussing this with a Jungian therapist was that some of her imbalance stemmed from the exhaustion of heart-spirit that demanding and intimate psychotherapy requires. She has literally depleted some of her reserves because of her compassion and intent to relieve suffering in the people she sees. These therapeutic "heart-to-heart" connections, risky as they are, can only be maintained by actual people, preferably working at a distance that doesn't require an electronic interface. Fortunately, the tools of Chinese medicine are available to help restore this practitioner's heart-spirit, so she can continue to offer therapy without "burning out"
Well, what about the access to electronic medical records that a doctor who never strays far from a a computer would have? Doesn’t that add a great deal to the "encounter"? Actually, most of this information suffers from the familiar "garbage in-garbage out" truism of computer data. Electronic medical records have check-off boxes and boilerplate descriptions, some of which is often hilariously incorrect when I see the records kept by other physicians on my referrals and consultations. Most doctors are not fast and perfect typists, so even if there is a place to customize anything more than a brief note in the record template, most doctors don’t have the time or the inclination to enter complex or detailed explanatory notes into the chart. As a result, most electronic "records", even when they are available, are of limited value to the clinician. The main purpose for these EMR’s is to facilitate billing and statistical analysis, as well as to flag "inefficient" practitioners who are not generating enough profits for their masters. 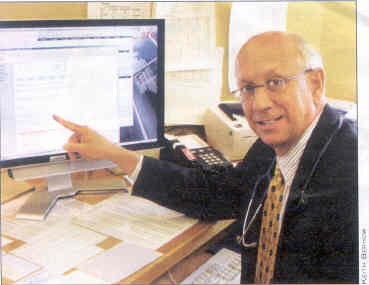 Dr. John Bachman, a family physician participating in a pilot program evaluating virtual visits at the Mayo Clinic states that "Online interactions have improved the efficiency of our in-office visits primarily because office time is not spent with sick people who truly need to be seen. Once you take care of the worried well, a nice gap opens up in the schedule." The "worried well"? How condescending is that? Perhaps Dr. Bachman has such superior diagnostic skills and predictive powers that he knows who really needs to be seen, but it is more likely that such smug arrogance is merely self delusion. After all, when something goes wrong, there is always the emergency room. Simple problems can indeed be taken care of by lower level practitioners, so a more efficient medical system would be one option. Perhaps avoiding this is the real motivation for virtual visits. Competition is another issue: "The online office visit provides a level of service that competes well with the retail clinics" says Dr. Bachman. Patients in the Mayo Clinic program are charged $35.00 if the virtual visit "requires medical decision making." If the patient needs to be seen, there is no charge for the virtual visit, but of course normal office fees will be applied. One wonders how it can be determined that a patient needs to be seen without a medical decision, but the logic of this entire enterprise is just as obscure. "We are literally paid to think, which allows us to the opportunity to have a profit margin that contributes to our overall mission. ", opines Dr. Bachman. Just don’t take too long or think too deeply, doctor. And don’t expect to have your diagnosis confirmed by a physical exam, because there won’t be any. Perhaps you can ask the paper boy or the mailman to look in on your patients and provide you with their observations.